Got the call this morning from Danny the Shearer - we're on his calendar for Thursday morning, March 8th. He'll come by bright and early, and have all 15 of our sheep separated from their wool in about an hour. Be here by 8 AM or you could miss it altogether... Danny doesn't dilly-dally. You're invited -- bring the kids, if you can! 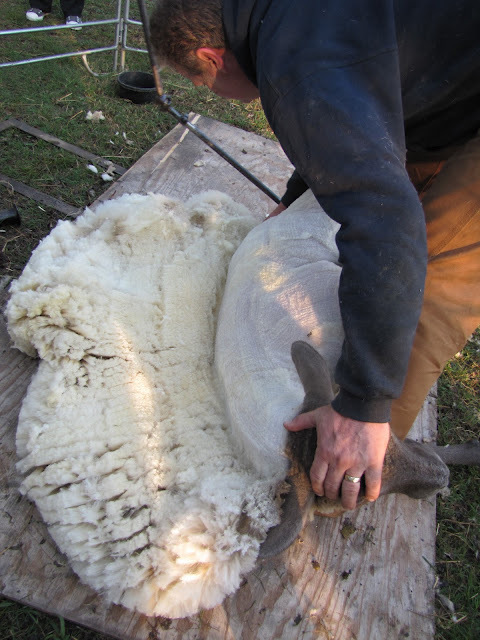 We always have such a great time on Shearing Day - if you can be with us for the fun, you'll love it. As usual, we'll have the skirting table up and the coffee pot on Once the fleeces come off, we'll skirt them and get them ready to wash. This year, my goal is to have the wool washed before the alpaca fleeces get sheared. Our routines are becoming more streamlined and efficient, so we can handle more gorgeous fiber for our shareholders. Doggone it! That's the first day of the Texas Storytelling Festival and it looks like we'll be telling in schools that morning. I was so hoping to finally make one of these and see this all up close and personal. Sigh, maybe next year.